Cricotopus (Cricotopus) latellai sp. 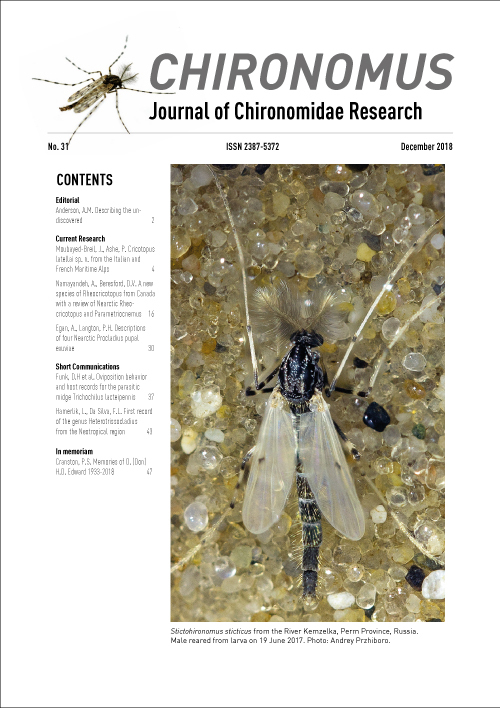 n. is described and diagnosed based on material comprising male and female pharate adults, pupal exuviae and larvae recently collected in some glacial streams in both the Italian and French Maritime Alps. Taxonomic notes provided in this paper include: description of C. latellai sp. n. as male and female adults, pupal exuviae and last instar larvae. The diagnosis of the Cricotopus tremulus-group is supplemented with additional characters in the male adult and pupal exuviae. Cricotopus latellai sp. n. keys near C. mantetanus Moubayed-Breil, 2016 and C. storozhenkoi Makarchenko & Makarchenko, 2016. Geographical distribution of C. latellai sp. n. is currently restricted to the Italian and French Maritime Alps. It belongs to the Tyrrhenian community of glacial relic species, which are considered to be indicators of climate change in this biogeographical region. Remarks, taxonomic position, and ecology of the new described species are given.